Minimalist design and maximum functionality. Strip cut shredder which shreds to security level 2. Elegant wooden cabinet with a break-proof plastic top cover - a timeless and attractive design. Easy to use electronic operation. Motor cuts out automatically when the door is open or the waste box is full. 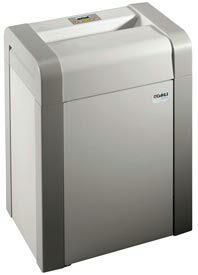 This shredder comes with a 5 year warranty against cutter fracture and a 2 year function warranty.